Two NEW AMT t-shirts* are ready to be ordered! Only $25 each**. They make great gifts, too! 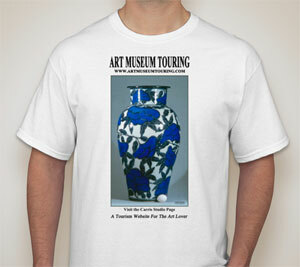 Profits from the t-shirt sales will go to enhancing and growing the Art Museum Touring website. Custom programming will allow the participating museums to post FREE their own activities with an image on the AMT Events Page up to 5 weeks in advance and have a Tweet sent from AMT about it. 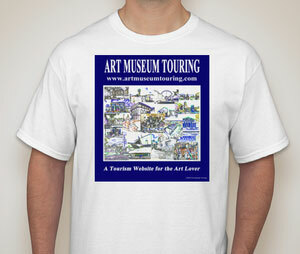 We wanted a fun t-shirt to give a feel for what Art Museum Touring is all about. This design was the end result of a lot of time playing, creating the hightly stylized museum images and multiple arrangements. There were about 3 or 4 earlier versions we tested before choosing this one. Would you like to see more "fun" museum t-shirts? Sherrie Carris using various metallic oxides and slips. The brushwork is done on top of the dried glazed piece before its final firing. The detail in the leaves is done by sgraffito. The actual piece is a cone 10 (approximately 2400 degress F) stoneware reduction fired vase. 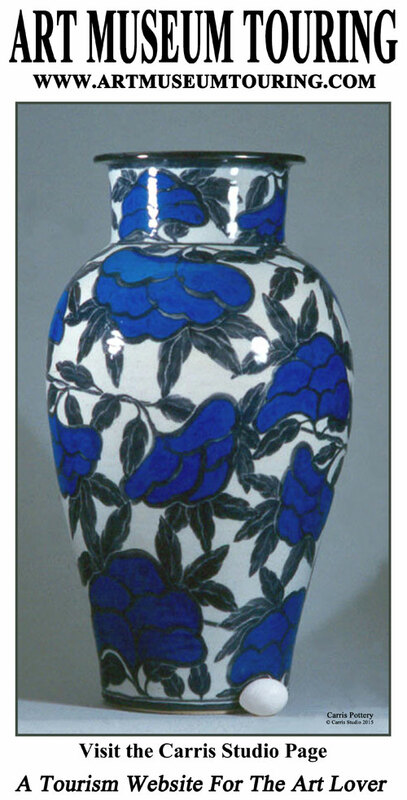 This vase is in a private collection. Would you like to see other designs we have created for our pottery on t-shirts? The PayPal automated ordering system, available for businesses to use, is unable to handle our "complex" shipping charges. At this time, it is necessary to send an email to tom@artmuseumtourng.com. The subject line should be T-Shirt order. Include mailing address(es) for the t-shirt(s); quantity and size(s). 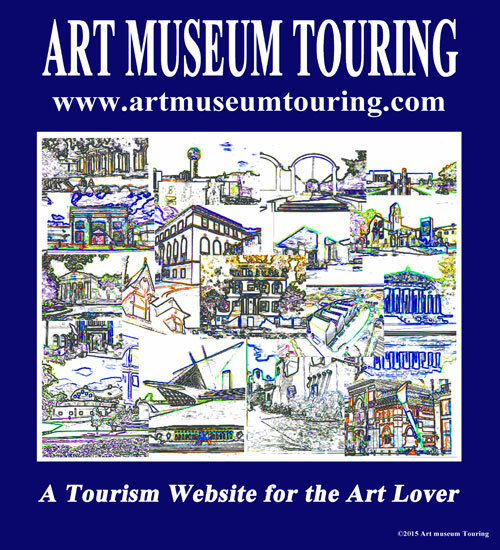 A PayPal invoice will be sent to you by Art Museum Touring. PayPal handles all payments and sends Art Museum Touring a notice when it is deposited in our PayPal account. You will be sent an email when your order is mailed. SHIPPING CHARGES (all prices are based on USPS Priority Mail good to anywhere in the United States. per address and come fully insured. *We do not have t-shirts on hand at this time since we have no idea of how many to order, or sizes. Once the order is placed, it takes 2 weeks for us to receive it. We will, then, begin shipping the t-shirts.